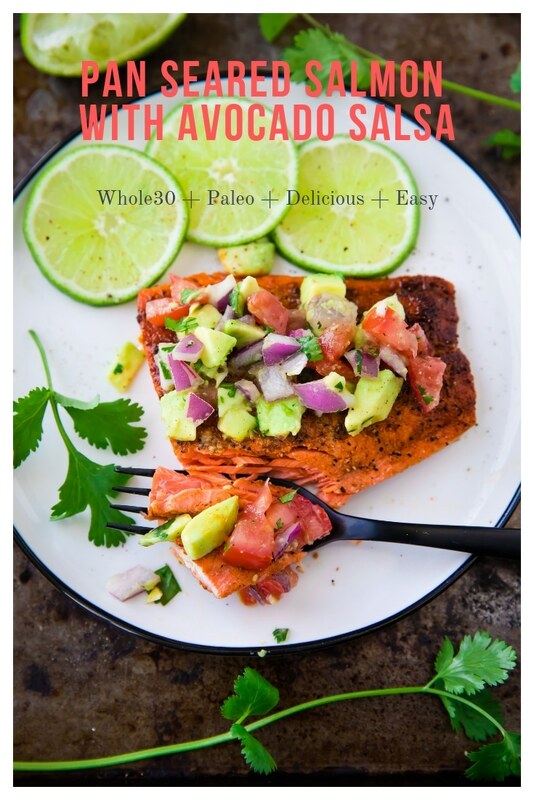 Pan Seared Salmon with Avocado Salsa is an easy, healthy, low carb, Whole30 fish recipe. Making this fresh, nutritious dinner requires just 7 ingredients and 10 minutes of cooking time! It’s perfect for a busy weeknight, yet elegant enough for company! FEAR NOT my “I don’t know how to cook fish” friends, because this post is for you! And by the end of it, you’ll be able to make a delicious (fancy looking) fish dish in 10 minutes flat. No really! This 10-Minute Pan Seared Salmon with Avocado Salsa is what I call a “faux fancy” dish. Why? Because it looks fancy but it’s not. 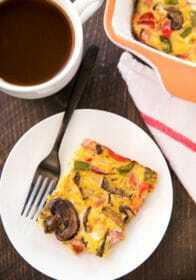 In fact, it’s made with just 7 ingredients and a large pan. Yup. SO SO EASY! WHAT TYPE OF SALMON DO I BUY? I’m VERY particular with the type of salmon that I buy for my family. You want high-quality, fresh-tasting salmon and you want to know you’re eating salmon that contains no artificial coloring, no additives, no hormones, and no antibiotics ever. After much research, my go-to salmon is Wild Caught Alaskan Sockeye Salmon. You’ll find that most grocery stores carry this and you can buy it in bulk from Costco. Recently, I’ve been using ButcherBox to purchase my salmon for the month and I’ve got great news, they are offering 2 pounds of free Wild Caught Alaskan Sockeye Salmon with your first purchase. This deal is only good for the remainder of January, though. Learn more and sign up here. 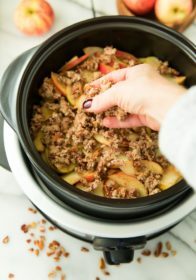 And if you want to know more about ButcherBox, check out this Easy Sweet Potato Beef Chili post. Now, let’s talk about seasoning fish, salmon to be exact. I rubbed each fillet down with taco seasoning for this recipe because it’s easy and my family and I just love taco seasoning on almost everything. 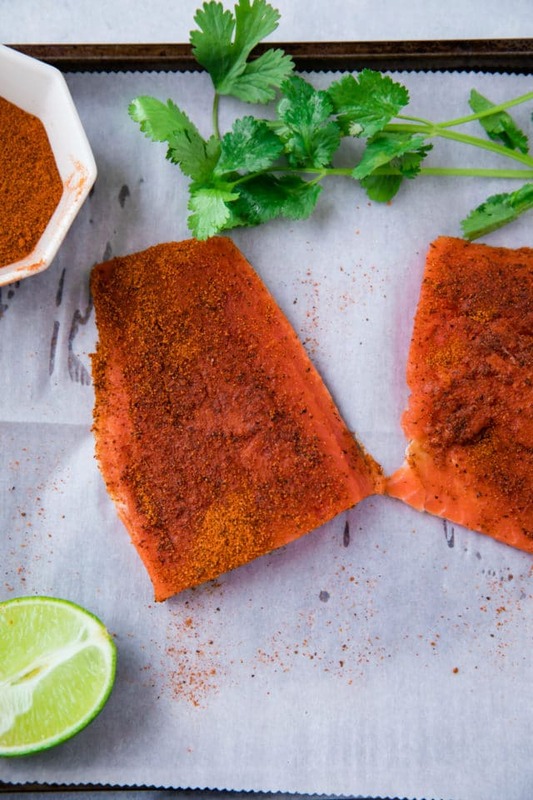 However, you could totally skip the taco seasoning and simply use salt and pepper or any favorite seasoning to season the salmon. 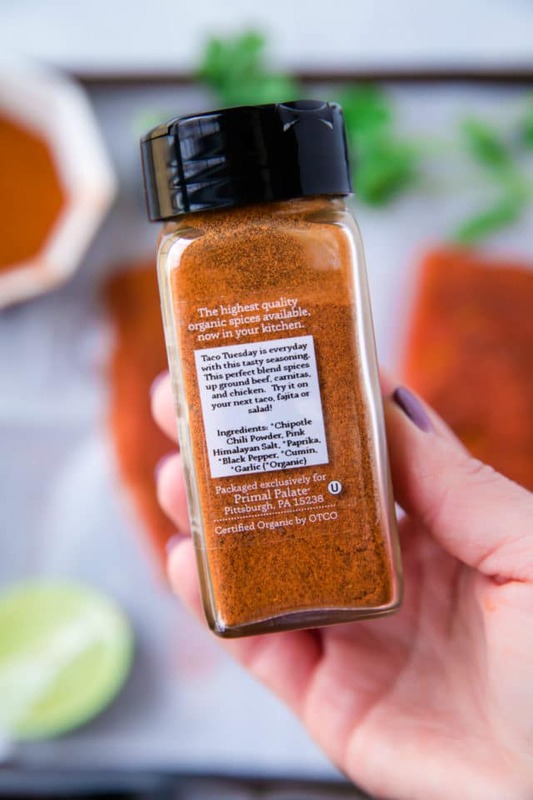 As far as taco seasoning, you can follow my recipe for homemade taco seasoning or use any other favorite recipe or store-bought variety. Since I’m participating in a Whole30 reset, I’m paying close attention to the ingredients in EVERYTHING, even seasonings. You’ll be surprised at the funky ingredients added to some spices. The Whole30 is all about natural, chemical free foods, so if sugar or any preservatives are added, it’s a no go. 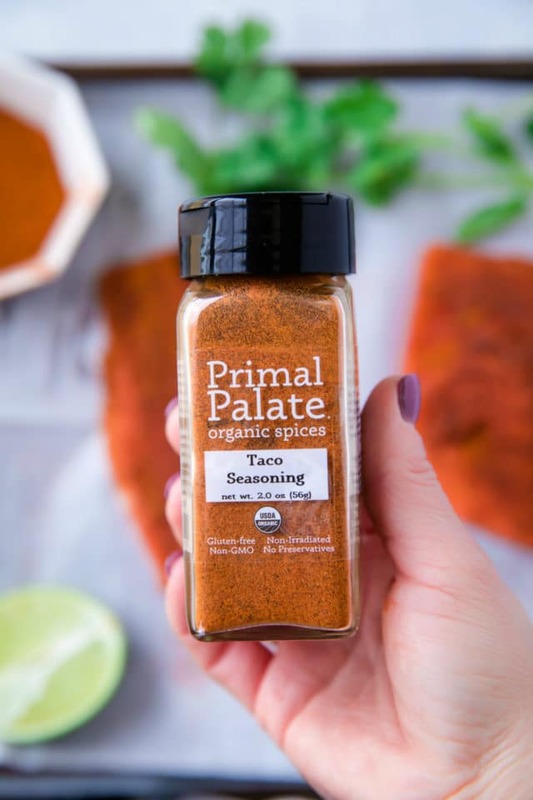 I’ve been using Primal Palate spices for awhile now and what I love about Primal Palate is they never add any weird ingredients to their spices. You can trust that the spices you are using are organic and all natural. I added a few different bottles of seasonings to my last Thrive Market order, but you can also find Primal Palate on Amazon. For some reason, there are people who find pan searing salmon intimidating. I’m here to tell you that you have nothing to fear – making pan seared salmon is SO easy! 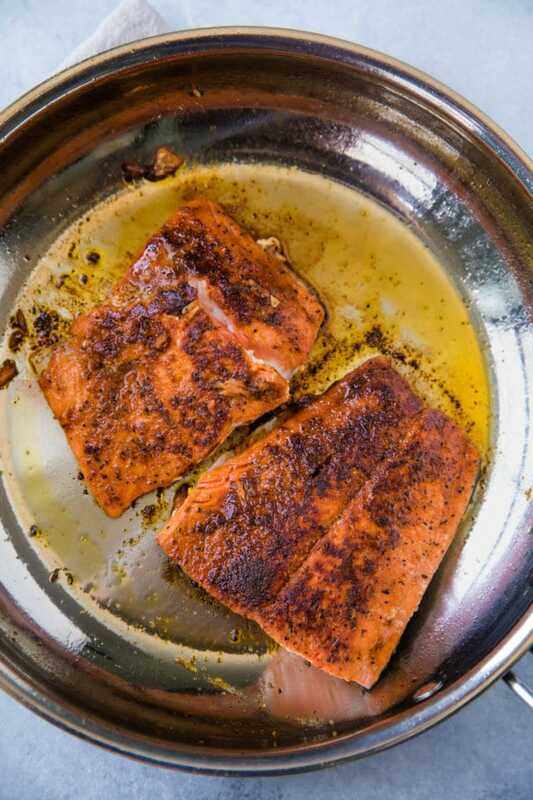 I have completely switched over from non-stick pans to more nontoxic stainless steel pans or cast iron skillets and these are the best to use when searing salmon. Avoid overcrowding while cooking, working in batches if you need to. Add salmon fillets flesh side down, to an already heated pan. Cover and sear, undisturbed, for about 3 minutes until crispy and golden, before flipping. If you don’t have a lid for your pan, just use a baking sheet. After 3 minutes, uncover pan, and flip. Cook salmon for about another 5 minutes. You will know salmon is done when the flesh is flaky when checked with a fork. Be aware that the salmon will continue to cook some after removed from the heat and you don’t want to overcook the fish, as it will become dry. Once the salmon is fully cooked, you’ll easily be able to remove the skin with a fork. 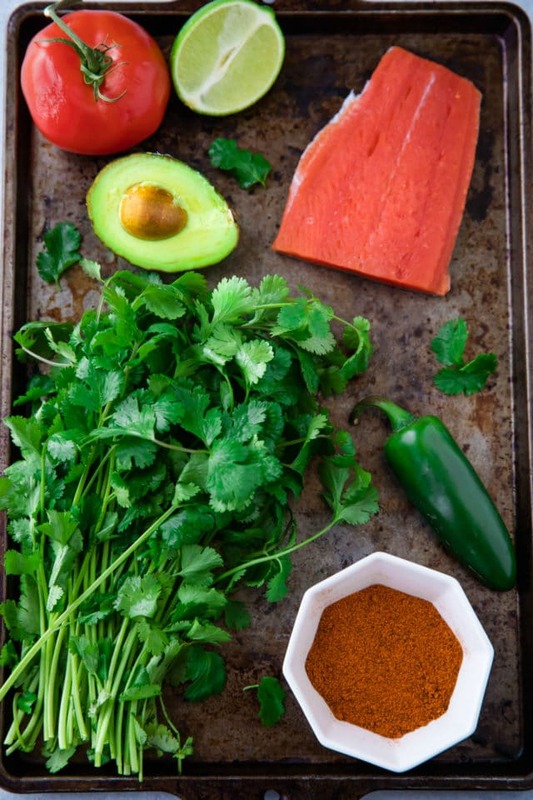 While the salmon is cooking, prepare the simple avocado salsa to go on top. 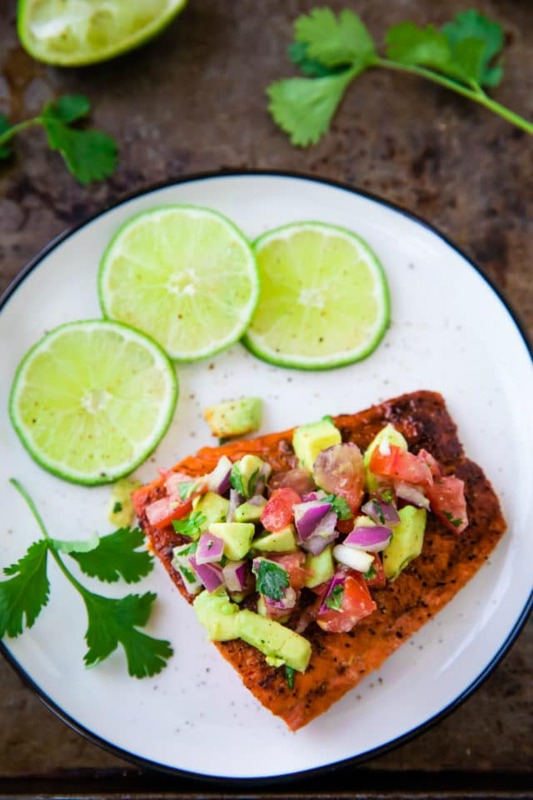 The salsa contains finely diced avocado, tomato and red onion, and is tossed with lime juice and cilantro for a fresh topping that pairs perfectly with the salmon. 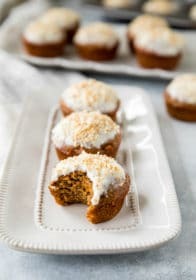 Hope you guys enjoy this recipe as much as my family does! This foolproof recipe delivers what it promises: a perfect, tender and flaky salmon fillet with deliciously crispy edges and amazing flavor. We love to pair this salmon dish with my easy 5-Ingredient Mexican Brown Rice recipe and tortilla chips with my best damn homemade salsa. This recipe is great, though, because you really don’t even need a side dish. The avocado salsa can serve as a side so you have an amazing 10 minute meal from start to finish on your plate! Pan Seared Salmon with Avocado Salsa is an easy, healthy, low carb, Whole30 fish recipe. 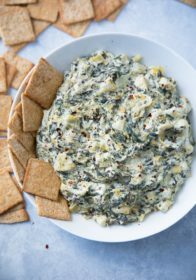 It can be cooked up super quick, making it perfect for a busy weeknight or an elegant date night dinner! Heat the olive oil in a large pan over medium high heat. Season the salmon fillets generously with taco seasoning. While the salmon is cooking, prepare the avocado salsa. In a small bowl, mix together the avocado, tomato, red onion, cilantro and lime juice. Season to taste with salt and pepper and stir gently until combined. 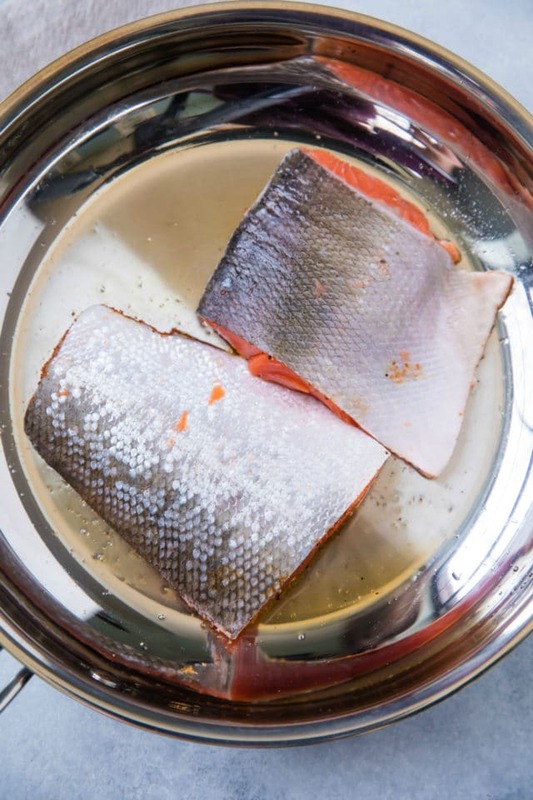 Once salmon is cooked through, remove skin with a fork and transfer to a plate. Top with avocado salsa and enjoy! *If preferred you can rub your salmon with seasoning, cover and store in the fridge for 30 minutes and up to one day. This is exactly my kind of recipe. I LOVE salmon, probably my favorite fish, perfect for ANY DAY. I also love using taco seasoning as a sort of “go to”, because I LOVE the spice level and combo. Perfect salsa for this! Salmon is my favourite fish so I ill be giving this a go later this week! The salsa looks so fresh and delicious! My husband has requested more salmon for dinner. I’m so glad I found this recipe to add to our mix. I could eat salmon every single day! Your salmon recipe looks fabulous. Especially with the avocado salsa! Brilliant addition. This sounds perfect for my dinner tonight! 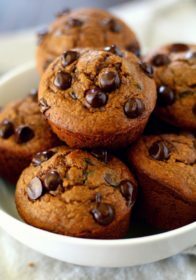 My husband has asked that we lighten up after the holiday over-indulgence… this is just what we need. Love that avocado salsa, too! This is the perfect salmon recipe. 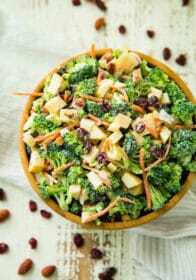 Not overloaded with toppings, all fresh ingredients and how easy. Good one! I am a lover of fish and this flavorful recipe is so lovely. The Avocado Salsa is a lovely combo to this fish recipe. This salmon looks soo delicious! I can’t wait to make it next week for dinner!! I love avocado salsa on top of salmon. Love how easy this recipe is – but yet still fresh and full of flavor! Salmon is my favorite fish to cook at home.